The first of a two part story. Frontier in Space also marked the first time any of the Doctors enemies met, in this case the Daleks and the Master. Though it would sadly be Roger Delgado’s last story as the Master, Frontier in Space is one of the best Pertwee era stories and a fitting send off for one of the greatest villains in the shows history. The Doctor and Jo arrive in the far future. The earth empire is expanding into space, but it has come into conflict with another great power, the Draconian empire. The Draconians are a race of sentient reptile people. Though a generally peaceful race, tensions have been building up between the Draconians and the earth men for many years. Recently both have begun to attack each others ships in hit and run attacks. Though the governments of both races deny having involvement in the attacks, war between the two empires seems an inevitability. The Doctor and Jo arrive on a cargo ship where the crew instantly assume that they are Draconians. Jo meanwhile sees the crew as Drashiggs, ferocious giant carnivores she had encountered on a previous adventure. Later the ship is attacked by Ogrons who the earth men still see as Draconians. The Doctor deduces that a third party is using some kind of hypnotic device to make people see what they fear the most. Jo Grant saw a Drashigg, whilst the humans of the ship saw Draconians, who humanity fears the most. Meanwhile when the Ogrons have attacked Draconian ships they have seen them as humans, as the Draconians fear humanity. Whoever this third party is that’s employing the Ogrons (who as mere mercenaries would not have been able to think of this plan on their own.) They are responsible for all of the attacks on both the earth and Draconian ships, and hope to set both empires against each other so that they can emerge in the aftermath and take over. When the crew come to after the Ogron attack they believe that the Doctor and Jo are traitors who were helping the “Draconians” and Jo and the Doctor are imprisoned. On earth the Doctor speaks to the President, and at one point is kidnapped by the Draconians who believe that he is a double agent set to discredit them. Sadly he is unsuccessful in convincing either that there is a third party plotting to provoke a war between them. The Doctor is later sent to a prison colony on the moon. There he discovers that the third party employing the Ogrons is his old enemy, The Master! The Master has using a forged identity become the chief of police and has framed the Doctor for several crimes. He decides to take the Doctor and Jo to meet his employers. It turns out that the Master is in the service of a greater power interested in provoking a war. The Master doesn’t say who they are, but tells the Doctor that they are very interested in meeting him. Along the way there however the Doctor escapes and after a fight with the Master, the ship drifts into Draconian space where all three are captured by Draconians. They are taken to meet the Draconian emperor himself. There the Master is rescued by Ogrons, and once again thanks to his hypnotic device, the Draconians see the Ogrons as humans. In the ensuing fight however, the Doctor is able to knock out one of the Ogrons, and after the Master escapes and the effects of the machine wear off, the Draconians are able see the Ogron for what it really is. The Draconians decide to use the Master’s ship to get back to earth, with the Ogron as proof of the Doctors claims. The Master however is able to intercept their vessel and capture both Jo and the Ogron. Back on earth the Doctor and the Draconian Prince again attempt to convince the President of what is really going on. The Doctor asks to be allowed to use a vessel to travel to the planet of the Ogrons. Though the President agrees, her attempts are shot down by General Williams, who had earlier torpedoed the Doctors attempts to convince the President. The Draconian prince calls out Williams bigotry, telling him that years ago he destroyed an unarmed Draconian vessel which helped to kick off the current hostilities. Williams insists that the vessel was not unarmed, and that it was a battle cruiser. The Prince however points out to Williams that the cruiser was unarmed, as its weapons were empty, and that they had only chosen a battle cruiser as that was the only way a nobleman of Draconia could travel. Feeling guilty for his past sins, Williams agrees to help the Doctor find the Ogron planet. When the Doctor, Williams, the Draconian Prince and the team arrive on the planet however, they not only find the Master waiting for them, but that he has summoned those who employed him to provoke a war, the Daleks! The Daleks slaughter Williams entire crew except for the Doctor, Williams himself and the Draconian Prince who are all taken prisoner. The Gold Dalek declares that the Doctor will be exterminated, but ironically his life is saved by the Master. The Master tells the Daleks that he wants to torture the Doctor more by showing him the earth, and the galaxy that he loves so much in ruins before killing him. The Gold Dalek agrees and leaves to prepare the army of the Daleks to conquer the Earth and Draconian empires after they have destroyed each in other in the Masters war. Jo also during a previous failed escape attempt had managed to steal the Masters fear device. The Doctor is then able to use it to hypnotise an Ogron into thinking he is a Dalek. The Ogron releases them, and Williams and the Draconian prince flee back to their home planets to warn their people of the Master and the Daleks plans. As the Doctor and Jo attempt to leave in the TARDIS they are ambushed by the Master and a group of Ogrons. Using the Master’s own fear device the Doctor scatters the Ogrons, but the Doctor is wounded by the Master in a shoot out before the villain flees. Jo helps a wounded Doctor get back into the TARDIS. There the Doctor sends a telepathic message to the Time Lords, telling them to help him make his way to the Daleks base so he can stop their plans. Frontier in Space is an overlooked gem in my opinion. A part of what makes it work is the world building it does. We are taken into the future of humanity in so much more detail than other Doctor Who stories. Like many later sci fi series such as Firefly, Frontier in Space doesn’t present the future as either being rosey like Star Trek, or completely terrible like in Terminator. Instead much like today technology and quality of life has improved for vast swathes of the population, but there is still sadly terrible corruption at the top, and vast inequalities and prejudice in other areas of society too. We see many problems in the future that aren’t necessarily integral to the plot, such as the prison colony on the moon, and the radical left wing resistance movement who though fighting against an unfair system are still terrorists. All of these help the viewer to feel as though they are watching a proper, fully fleshed out world. Its also interesting the way the Doctor isn’t able to fix all of the problems in the future too. For instance the rebels on the moon who tried to help him escape are just left to rot after the Master captures the Doctor. Again it gives the setting a tinge of realism, as after all the Doctor can’t fix everything. When he arrives in modern day for instance he is only able to fix problems like the Axons invading the earth, rather than the energy crisis. So here its the same. He can stop the Daleks from destroying all of humanity, but ultimately even if there are huge inequalities and problems facing human society, and good people suffering. He has to just step aside and let humanity sort its own problems out. The main characters are also well fleshed out and acted too. The President played by Vera Fusek is quite an interesting character in that she is shown to be a fair and just woman, yet at the same time she is completely powerless against those around her, such as General Williams. You’re not sure whether she is someone doing her best to fight against an unfair system, or just a spineless puppet who is easily manipulated by those around her. He knows that he acted rashly in destroying the Draconian ship, so the only way he can not feel guilty is if the Draconians are total monsters. When he is faced with irrefutable proof that he did commit murder, then he realises that he must try and make amends and ends up becoming a heroic character, helping the Doctor and the Prince foil the Master. The Draconians themselves are brilliant aliens. Their costumes are very well realised. As Jon Pertwee himself was often fond of pointing out, the Draconians benefited from having a design that could allow the actor a chance to actually use their facial expressions in their performance. You can tell that Jon Pertwee really enjoyed working alongside them which works even more in universe, as the Doctor has a great admiration for the Draconians and their culture. Much like with his other more famous monsters the Silurians, Hulke goes to great lengths to make the Draconians seem different to humanity, but no more evil or good. The Draconians ultimately just wish to survive. They have no desire for conquest, or any real hatred of humanity. Their culture isn’t exactly rosey, as they view women as inferior and refuse to even allow them to speak without the permission of males. At the same time however the Draconians are shown to be far less xenophobic than humanity. Not only did the humans provoke the initial hostilities, but they also are more desperate to go to war than the Draconians are too. Its not just General Williams, the whole earth population is in support of a conflict as seen in the famous moment when a rabble rouser on the streets is shown to drum up support for exterminating the Draconians. In contrast the Prince though arrogant and condescending, is desperate when he first meets the Third Doctor to prevent any bloodshed, whilst the Emperor is practically the only figure of authority on either side who gives the Doctor a fair hearing too and has no hatred or prejudice towards the humans. The Emperor of the Draconians is shown to be respectful of the humans too. He even allows Jo Grant to speak in his presence, as even though women are forbidden to do so in Draconian culture, he respects that it is allowed in Earth society. The humans meanwhile regularly refer to the Draconians as Dragons in a degrading way and appear repulsed by their very presence. The relationship between the Draconians and humanity is a metaphor for Cold War tensions. In this respect many have compared Frontier in Space to various episodes of the original Star Trek series involving the Klingons. The frontier in space between both races is a very similar concept to the neutral zone. In some respects however I think the Draconians are a superior take on the whole cold war in space idea than any episode involving the Klingons in Star Trek TOS. Obviously overall the Klingons are far better aliens as their society has naturally been fleshed out over the years, unlike the Draconians. However though the Klingons were a good metaphor for the horrors of the Soviet Union. A problem I feel there was with some of the TOS Klingon episodes, was that the Federation, who were meant to represent the USA, where portrayed as whiter than white. In the real cold war of course we know it was far from the truth. America was responsible for invasions of other countries such as Vietnam where they used some of the most obscene chemical weapons ever devised as they bombed their enemies “back to the stone age”. They also backed and supported some of the most brutal regimes and dictatorships such as the Khmer Rouge, and Augusto Pinochet too. With this in mind as much as I like Star Trek, it can feel a little bit rich when we see the Federation portrayed as the absolute good guys with no faults at all. Frontier in Space however offers up a more nuanced and fair approach, by showing corruption, inequalities and labour camps in both societies, and not painting either as strictly the good guy. In this respect the Daleks can be seen to return to their original role as the Nazis as they are the force that unites both the soviets and the west. The Daleks and the Nazis aren’t just fascists who want to consolidate their power. They actively want to exterminate anyone who doesn’t fit in with their idea of the master race, so naturally everyone ends up becoming their enemies too. This idea is explored later in Genesis of the Daleks. One of the reasons the Doctor spares the Daleks is because he feels that many future worlds will become the allies with each other because of their fear of the Daleks. I’d like to think that Draconia and Earth were an example of this. The Daleks and the Master are used effectively in this story. The Master’s plan is one of his best, to make his enemies destroy one another rather than just another invasion. Throughout the story he generally is two steps ahead of the Doctor and Jo, with both regularly playing into his hands, alongside the humans and Draconians. 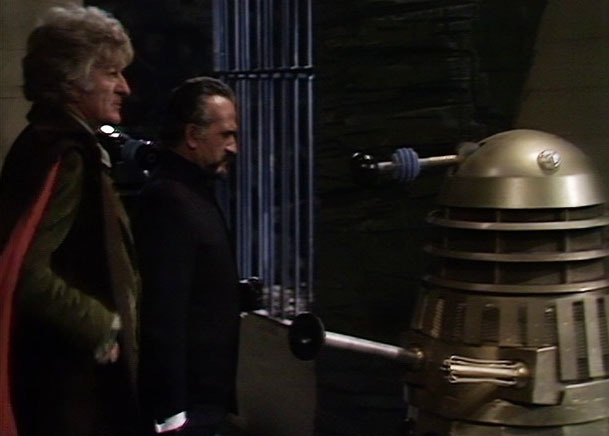 Throughout most of this adventure the Doctor is desperate and struggling to get people to listen to him, whilst the Master is a respected member of the police force. That was always the best thing about the Master. Unlike the Doctors other enemies like the Daleks and Davros, the Master could turn the people the Doctor was trying to protect and even in some cases care about against him. Delgado’s performance is excellent as always. I love the way he switches from appearing charming with Jo one minute. Jokingly telling her that she has his sympathies when the Doctor bores on about the Time Lords exiling him, but then turn vicious in a second when he stuffs her into an airlock and taunts the Doctor that he will eject her into space. To me this is far more terrifying than making the Master just a cackling psychopath as here you never know when he is going to snap. Furthermore you can actually grow to like him when he is joking around with the Doctor and Jo, which just makes it all the more horrible when he threatens Jo and tries to brutally murder her without a seconds hesitation. Delgado is also able to work a lot of great humour into the villain too, in moments such as his tantrum at the Ogrons for being cowards, his speech about preserving law and order (which prompts the Doctor to ask him if he is feeling well?) And his reading War of the Worlds as he provokes a war between two planets. The only disappointing thing about this story is that it offers no conclusion to the Delgado version of the Master. To be fair it was never intended to. The plan was for Delgado to reappear next season in Jon Pertwee’s final story. Sadly however Delgado was killed in a car accident not long after filming Frontier in Space, so it ended up becoming his swansong. As a story to go out on, he couldn’t have asked for a better script, but it is a bit of anti climactic end to his character, just to see him retreat back into the shadows for good. The Daleks role in this story is obviously limited as they only appear at the end, but even then the writers make sure to treat them as a big deal. Much like in Day of the Daleks, just three Daleks are shown to be dangerous. They completely slaughter a heavily armed earth expedition without breaking a sweat, and the Doctor tells the Draconian prince and Williams not to even bother firing at them as their weapons won’t even make a dent in the Daleks armour. The voices supplied by Michael Wisher (who later went on to play Davros.) Are much better than those for Day of the Daleks. Wisher adds a the proper hysterical quality to the Daleks screeching voices. The only disappointment is that we don’t get to see the Daleks and the Masters alliance in great detail. Though in a way I suppose its good that unlike in Doomsday neither are undermined for one another. Still I would have liked to have seen how the two villains came to work together, as well as how they planned to stab in each other in the back. We only get a tiny glimpse of that when after the Daleks have left the Master sneers at them, that they’ll see who rules the universe once the war is over. Its a great moment, and I loved the way that the Master calls the Daleks “stupid tin boxes”, but sadly other than that this story doesn’t make much of the fact that it was the first time any of the Doctors archenemies met on screen. Overall Frontier in Space is pretty much a perfect story for me. It has a brilliant, intelligent and engaging storyline, interesting supporting characters, a fully fleshed out world, and in spite of its ending, is a fitting send of for Roger Delgado’s Master, one of the best villains the show has ever seen. There isn’t really anything I can fault in the story. Even from a production stand point, the sets are very well realised and the Ogron and Draconian costumes are very effective too. The only special effects failure that might have let the story down, the giant Ogron eater was thankfully cut, and only gets a fleeting cameo where we get a glimpse of how big it is. Overall to me Frontier in Space is a brilliant story that deserves more appreciation. In the top right hand corner is a concept drawing for the design of the Cybermen originally slated to appear in Frontier in Space. Originally this story was to feature the Cybermen in place of the Ogrons as the Masters soldiers to attack both the Draconian and Earth ships. The Cybermen would have been working as equals with the Daleks and the Master to provoke a war, rather than as their servants like the Ogrons (with all three planning to stab each other in the back once the war was over.) The finale episode where the Daleks capture the Doctor, would also have taken place on Telos, the adopted planet of the Cybermen, with the sets from Tomb of the Cybermen being recreated. Sadly this was scrapped at the last minute and the Ogrons were used instead. Personally as much as I like the Ogrons, I think that it would have been better with the Cybermen. It would have marked the Third Doctors only encounter with the Cybermen. He would go on to encounter them in 20th Anniversary story The Five Doctors, but sadly he was the only Classic era Doctor never to encounter them during his era. Also I think that had the Cybermen been used then it would have been more genuinely surprising when the Daleks showed up at the end. As it was, because the Ogrons had been introduced as their servants, then it was obvious that the Daleks had some kind of involvement from the start. As to why the Cybermen were scrapped, no reason has been given, but there are 4 possible reasons. 1/ Terrance Dicks, the script editor during Jon Pertwee’s time HATED the Cybermen. He considered them to be boring, dull and useless. Dicks also appeared to dislike Kit Pedler, one of the creators of the Cybermen personally too. He called Pedler whiny, difficult to work with, and said that Pedler was no where near as talented as he thought he was. He said that all Pedler was good for was the occasional idea and scientific knowledge. Dicks hatred of the Cybermen would later lead to him having them get slaughtered memorably by the Raston Warrior Robot in The Five Doctors. With this in mind its not exactly surprising that the Cybermen didn’t appear in the 5 years he was script editor. Though they were still considered for this story, perhaps Dicks ended up putting his foot down on the decision. 2/ Jon Pertwee who played the Third Doctor wasn’t exactly enamoured with the Cybermen either. Though its true that he didn’t like the Daleks who appeared 4 times throughout his era either, the Daleks were simply far too popular to be left out of the show. Furthermore in contrast to the Cybermen, Terrance Dicks felt the Daleks were effective and got a long well with the creator of the Daleks, Terry Nation who he became friends with. 3/ Its possible that Terry Nation didn’t like the Daleks and the Cybermen meeting in this story. Whilst Nation was good friends with Cyberman co-creator Gerry Davies, he still didn’t like his monsters having to share the screen with other monsters and vetoed an attempt to bring the Daleks and the Cybermen together in the 1960s. When the Daleks and the Cybermen did finally meet in the 2006 story Doomsday, it was ten years after his death in 1996. 4/ They may not have simply had the budget to not only make the new Cybermen costumes, but also recreate the ice tombs of Telos. To be honest this seems like the most likely explanation, as the planet of the Ogrons, yet another quarry was obviously cheaper, whilst it would also have been cheaper to use the old Ogron costumes too. Whatever the reason, sadly the Cybermen were not used, and their only appearance throughout the entire Pertwee era, is a tiny cameo in the preceeding story Carnival of Monsters. This was Roger Delgado’s last story as the Master. He was killed in a car crash not long after finishing the story. The death of Delgado, a close friend of Pertwee, as well as the departure of Katy Manning who played Jo Grant, both contributed to Jon Pertwee leaving the show next year. The Master would return just 4 years later where he was played by actor Peter Pratt instead. This story and the next Planet of the Daleks, were originally conceived as one twelve part epic, with Letts hoping that it could rival The Daleks Masterplan. However again part way through production, Letts worried that one story wouldn’t be able to hold audiences for 3 months, and so they were split into two connected, but ultimately separate stories. The end of this story where the Time Lords help the Doctor follow the Daleks to their base, marks the first time that there is any kind of conflict between the Daleks and the Time Lords in general, not just the Doctor. Jon Pertwee always named the Draconians as being his favourite monsters. Pertwee praised them for the way you were able to see the actors mouths and eyes and therefore could act off of them properly unlike the Daleks or the Cybermen. Worldbuilding is very important, so I see what you mean about it raising the value of this story. Thanks man appreciate the comments and really glad to have you as a supporter.